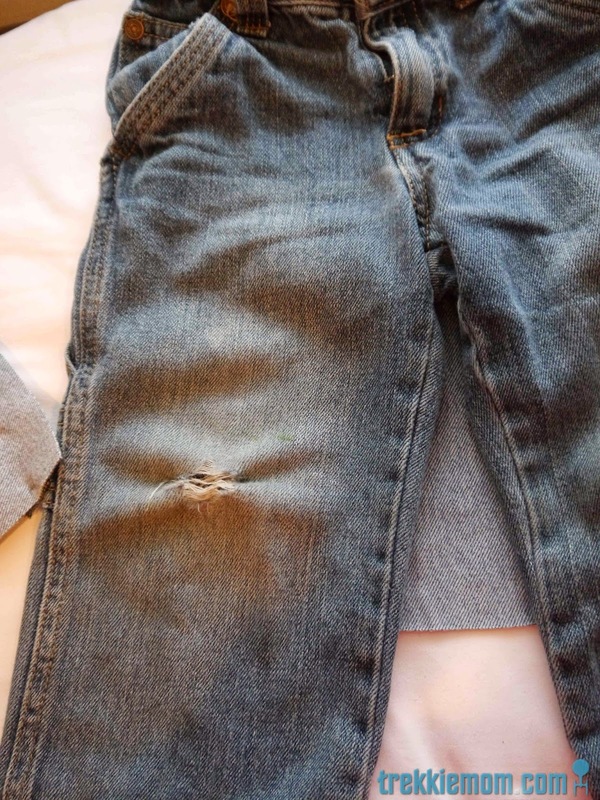 I have mentioned at least once with my Union Jack Jeans how my boys can put holes in their clothes, especially the knees of their jeans. 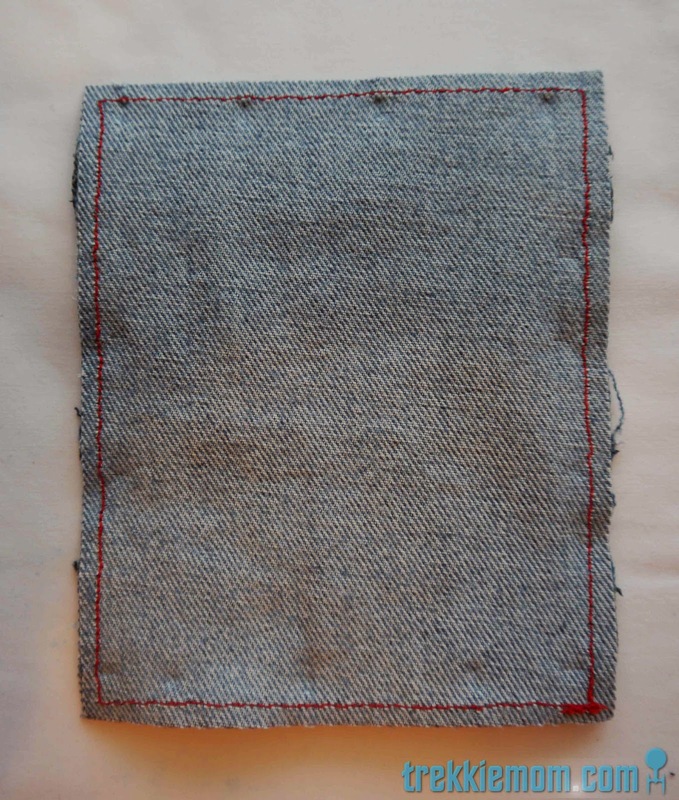 I have used the iron on patches, and they are never long or wide enough. Even when I stitch them down after ironing them on, my kids still manage to kill the stitching and separate the patch from the fabric. 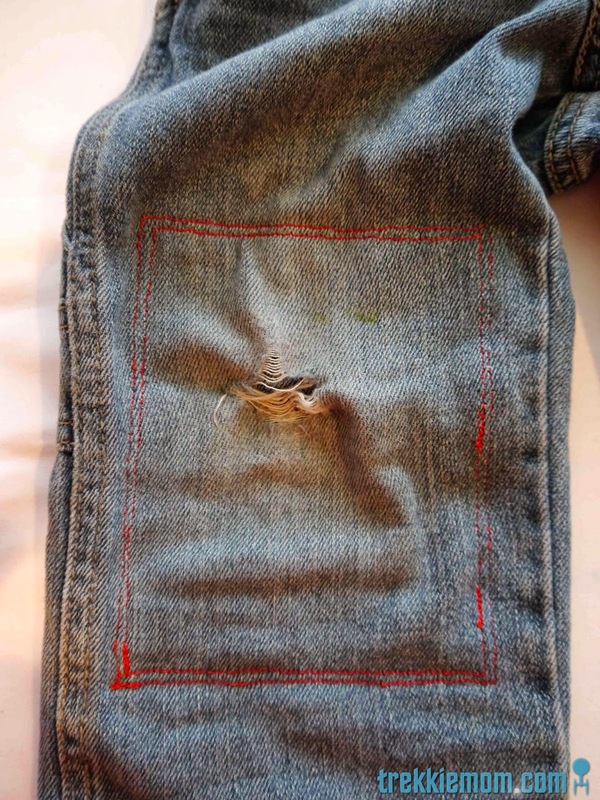 Well, I have decided to start a bit of a series on how I have patched my children's clothes, mostly jeans, but we have had the Scissors and Pajamas Don't Mix business and some other random holes, so I expect other projects to make it into this series. We will just have to wait and see what my boys are able to do, or undo as the case may be. 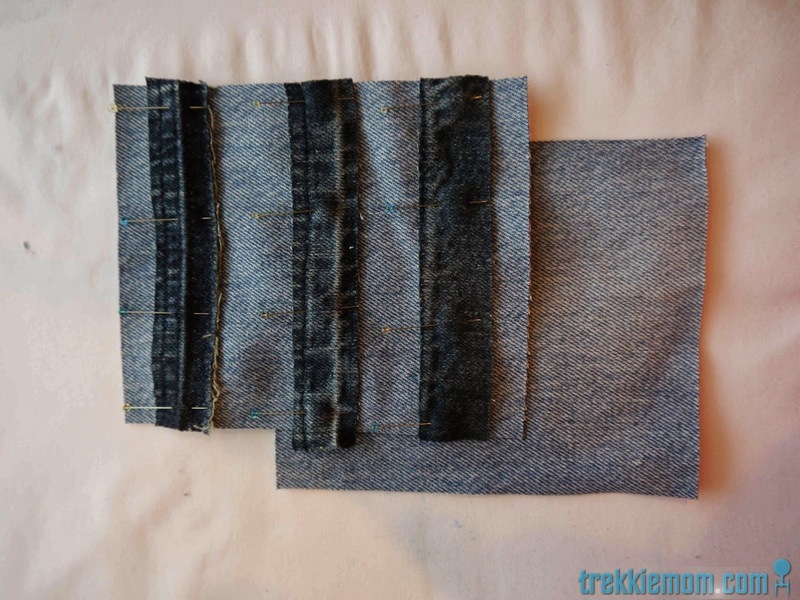 I started by judging how big the patch should be for the 2T pants on my patch pile. It is important to make sure your patch will exceed the stressed area. See all the whitish, faded area around the hole? That is weak material. 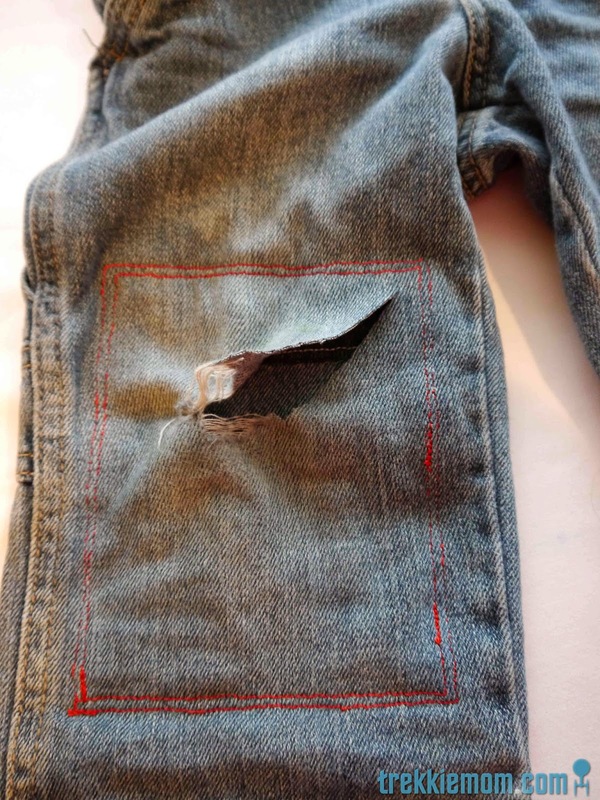 You also want to make sure that the seams that secure your patch are beyond the danger zone, or they may join the problem like the iron patches did. 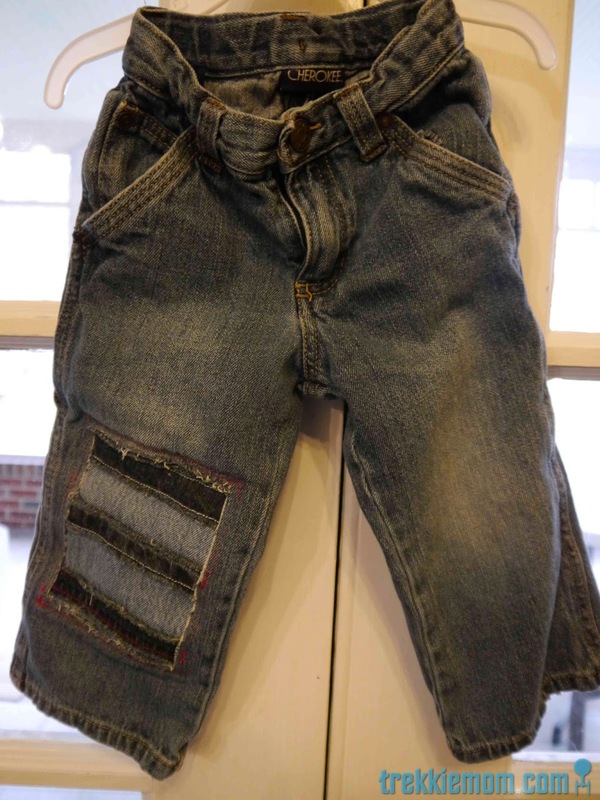 For my son's 2T jeans I decided that 6" by 5" would do the trick by covering all the weak material and allowing the connecting seams to be beyond the immediate knee slide zone. 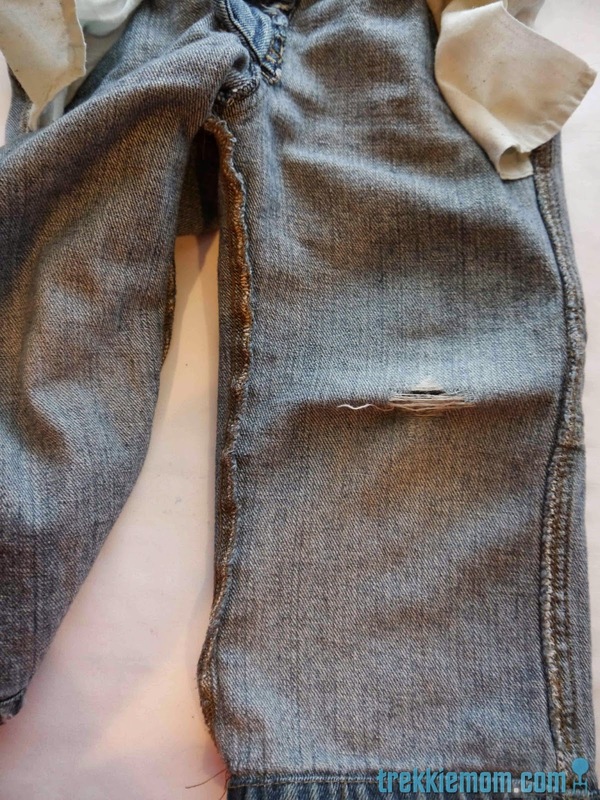 With the height (6") and width (5") determined, I got to cutting the right size from an unrepairable pair of my husbands old jeans and pair of my son's jeans with a broken zipper. 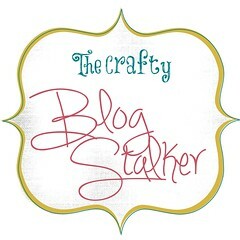 Yay, upcycling! 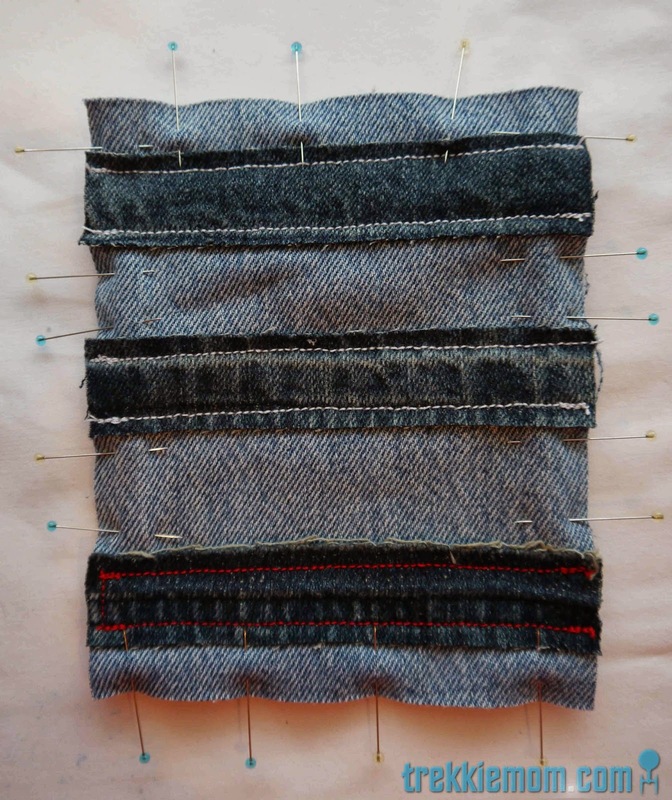 I cut 2 6"x5" pieces and 3 1"x5" pieces for the horizontal lines of the patch. I also used 2 different colors of denim. 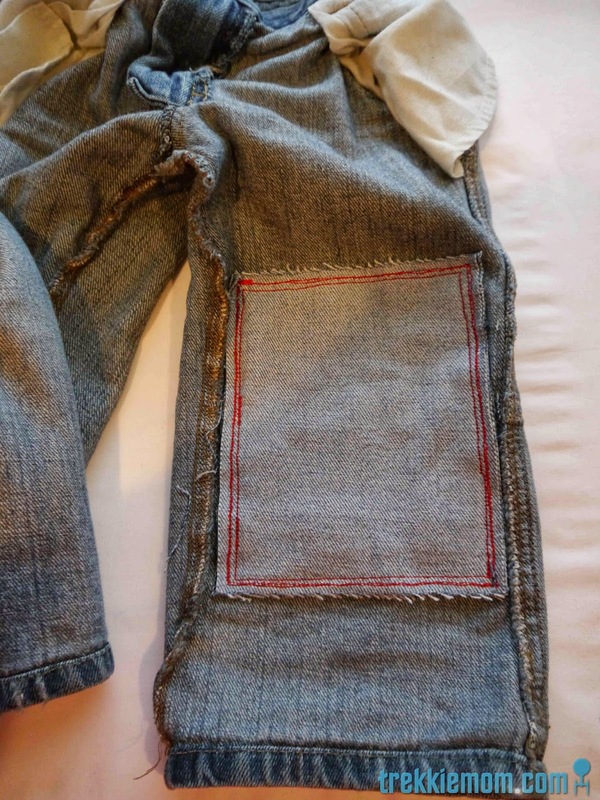 However, this will work just as well with the same color denim because of the fraying, or you can flip the same color denim to the 'wrong' side to get a different look/color. I positioned my horizontal strips about one inch apart from each other on only ONE piece of the 6"x5" pieces. 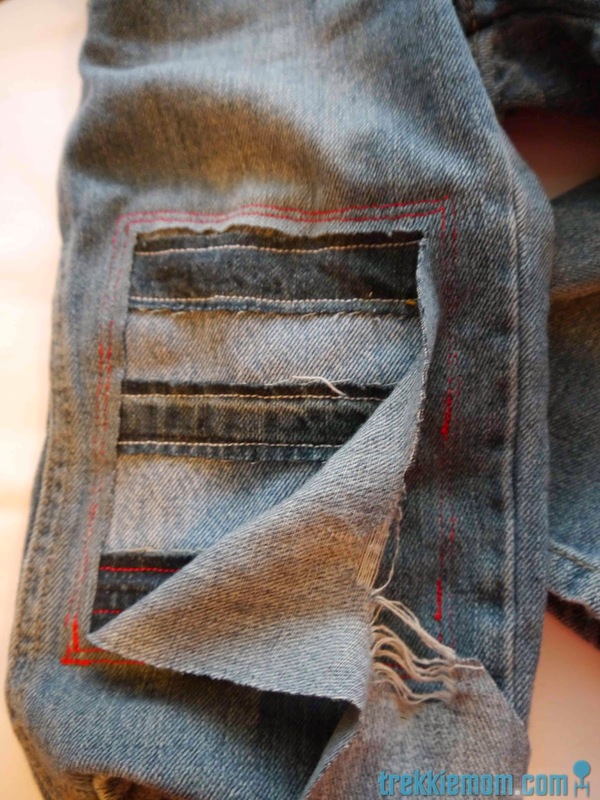 I then sewed down the horizontal stripes staying approximately a quarter inch away from the raw edge. 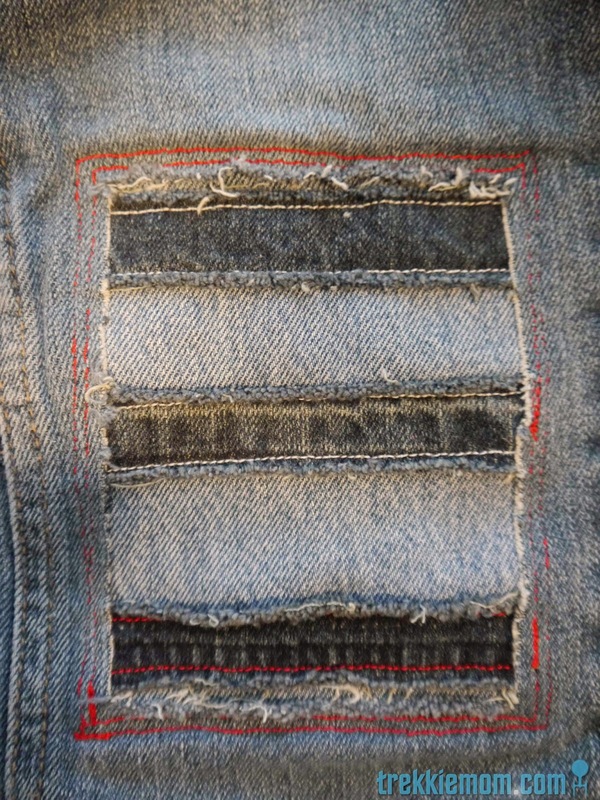 This allows the edges to fray nicely without sacrificing the integrity of the stripes. 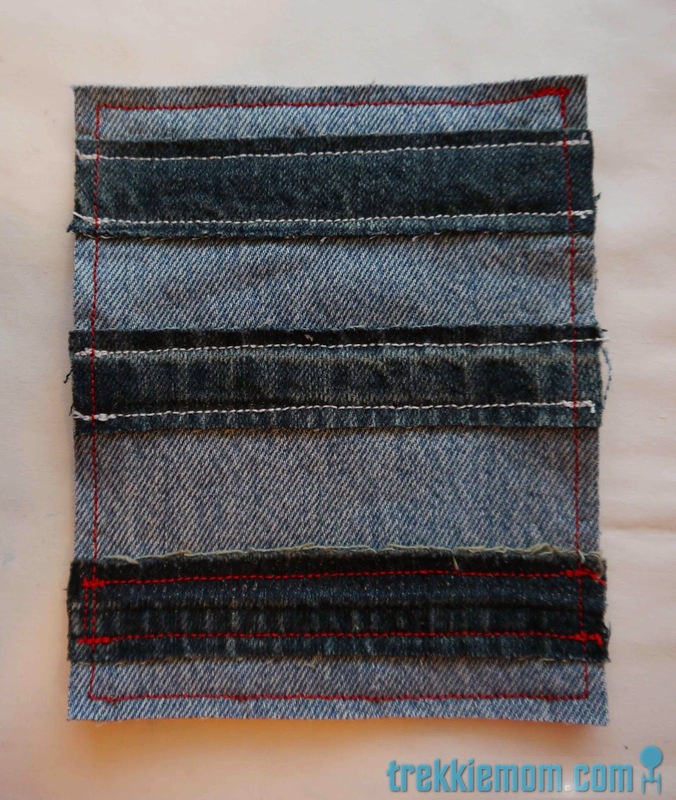 Then, I pinned it to the second piece of 6"x5" denim piece and sewed approximately a quarter inch seam allowance all the way around. 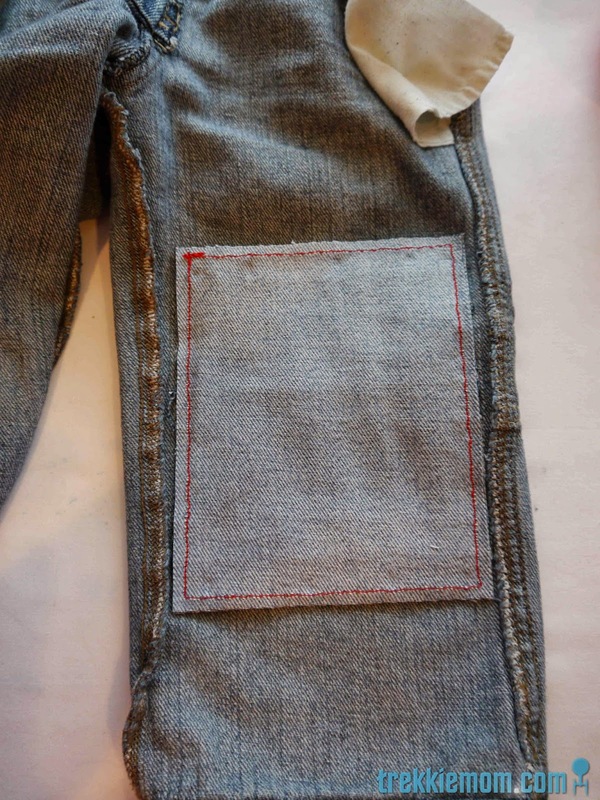 With the second piece of 6"x5" denim, I get an extra layer for my boys to break through, as well as covering up the seams on the knee which might make it uncomfortable for them to wear. 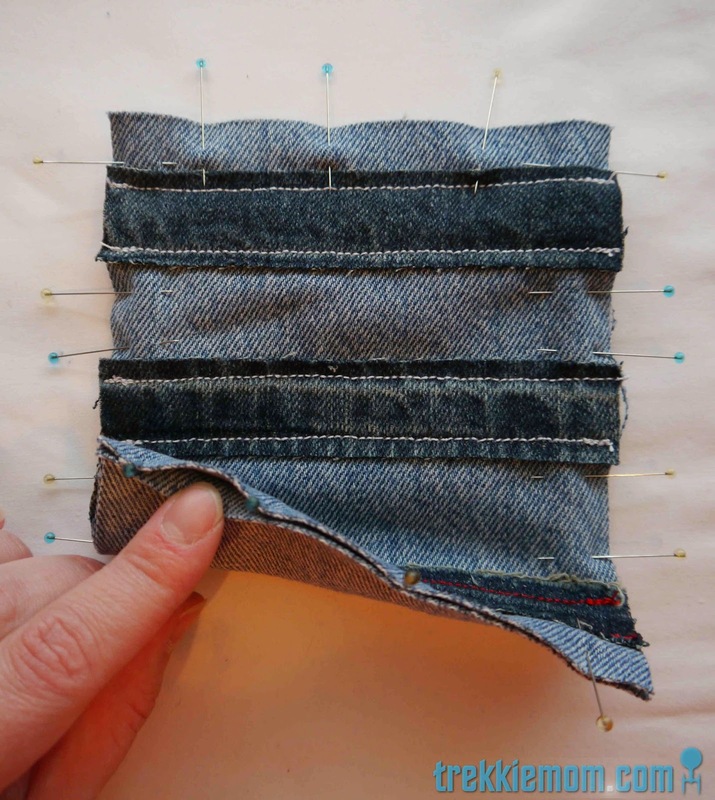 Next turn the jeans inside out, and center your patch on the hole. Pin that sucker down. Oh, and make sure you don't catch any of the fabric for the back leg. It might make it rather difficult to fit your kid inside these puppies again. 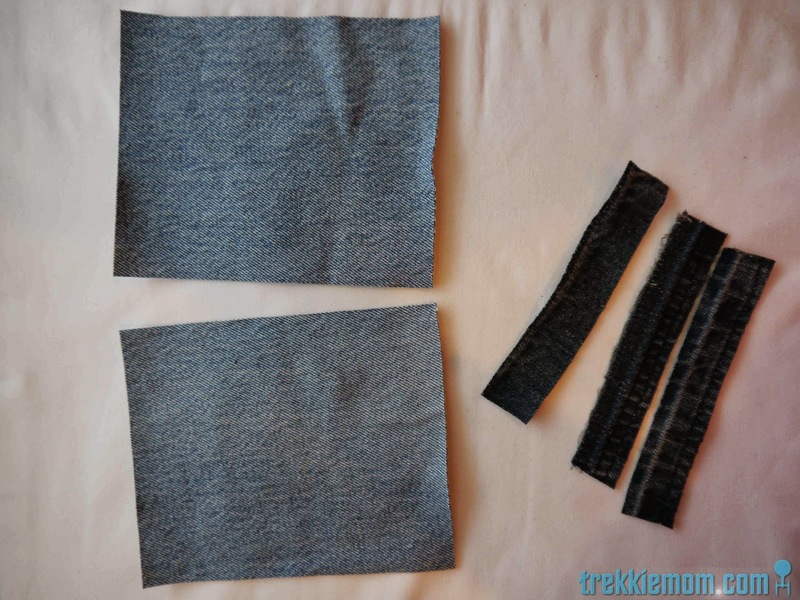 Since kids' pants are generally so small and skinny, and I stitched around my patch twice, yes twice, there was a lot of cursing as I bunched the pants fabric up just to sew an inch at a time. But because he should never be able to put another hole in this knee again, I am satisfied. 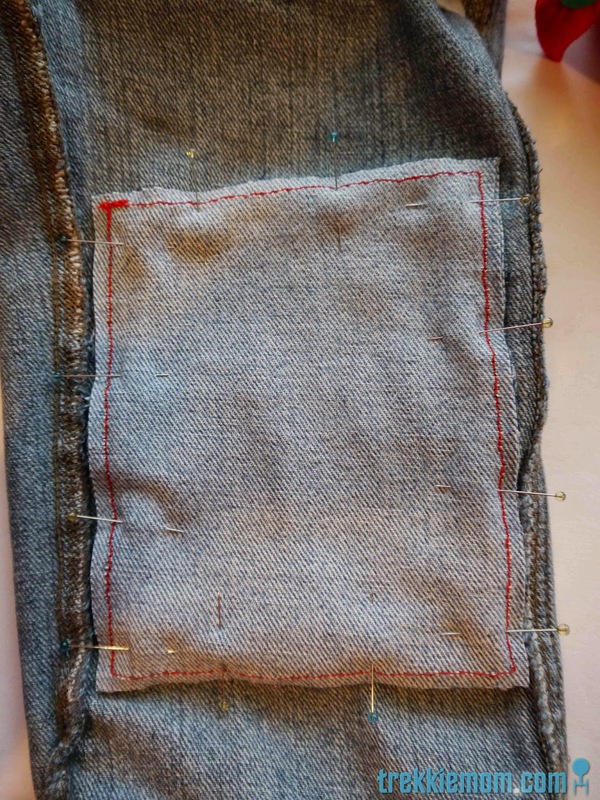 Finally, after all of that suffering, I flipped the leg right side to, and started to cut away the dead material, leaving another quarter inch seam around that hard won stitching. Oh, and I almost forgot that most important step. 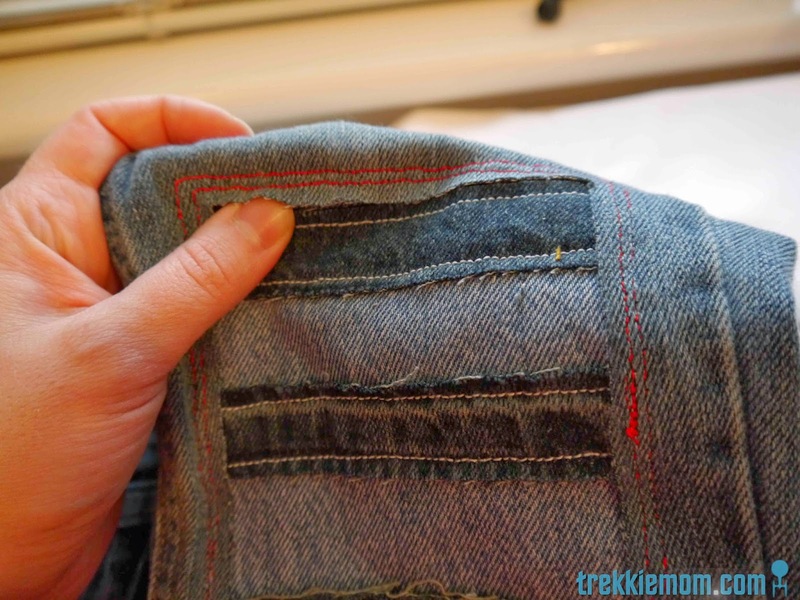 Wash and dry the pants to get that all important fraying. 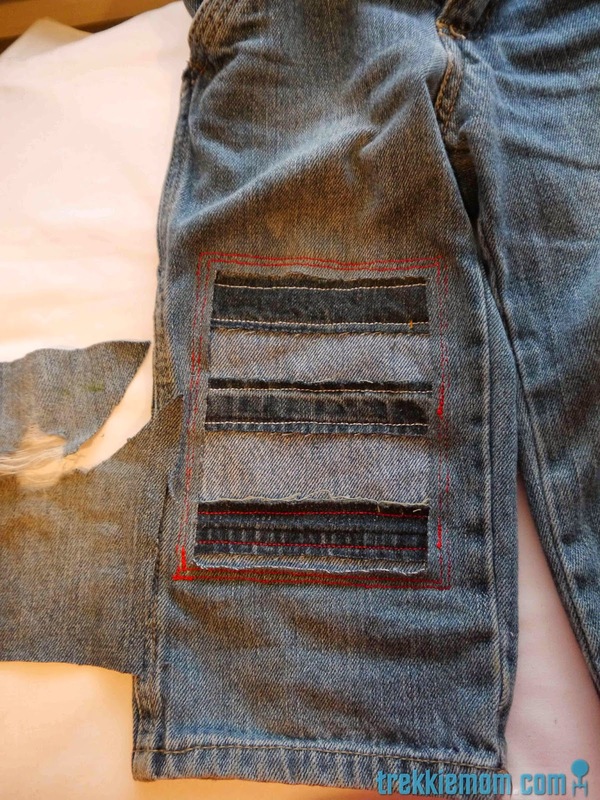 I had to cut of the longer threads for only 3-4 washes with the Union Jack Jeans, so I expect the same with this pair. Was it worth an hour or two of my life to make my kid one of the coolest kids with patched knees? Yes, it was! 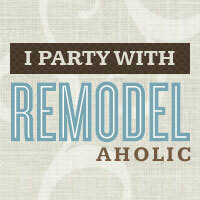 Because that makes me a cooler Momma. Well, I hope you enjoyed this tutorial-ish post. I have diagonal lines in the pipeline for my older son to add to my Project Patch Series, so come back soon. Hi…thanks for stopping by Pandora's Box - to answer your question, yes I used ModPodge (heavy Duty- a few coats), then I used a polyurethane over all of it - I doubt it will wear down!